I'm a big believer in having a stash of frozen puff pastry at the ready at all times. What's not love about a flaky, buttery pastry dough that can wear savory or sweet toppings with ease? When I saw the tart cherries in last week's CSA box, I wanted to avoid the obvious (pie) and strike out on a different path but wasn't sure what direction to go. 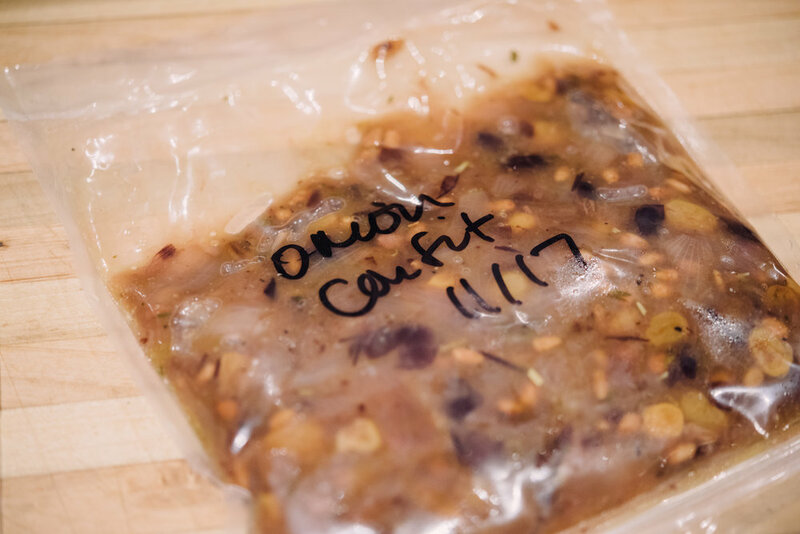 I was cleaning out the freezer and spied the onion confit that's been sitting in there since last Thanksgiving. It was the perfect base for the roasted cherries and chèvre -- just sweet enough to compliment the cherries but savory enough to balance everything out. Since cherry season is still going, this tart will be on the table a couple more times until the season runs its course! Line a sheet tray with parchment and place the puff pastry on the sheet tray. Place in oven and cook for 10 minutes. 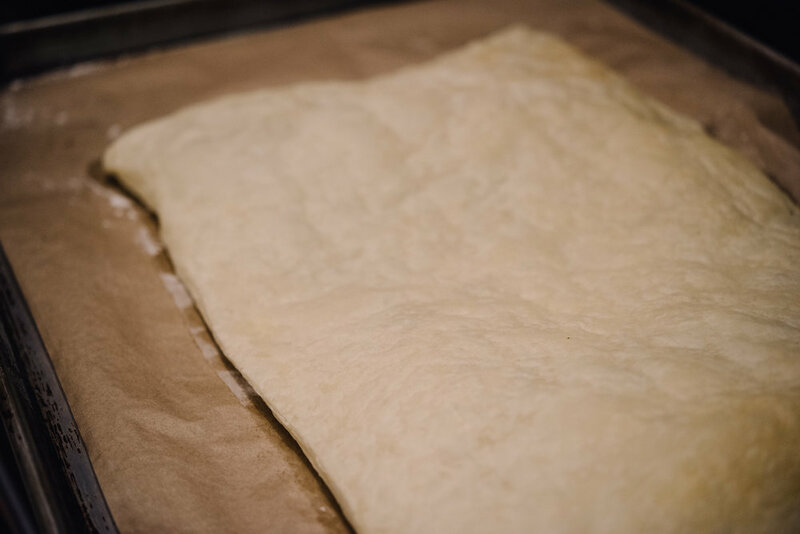 Remove from oven and cut a rectangle (leaving about 1 1/2 inch border) in the middle of the puff pastry. For tips on how to cook with puff pastry, check out this link. Set aside. Place the cherries, balsamic vinegar, olive oil, 3/4 teaspoon of kosher salt, and 1/2 teaspoon of black pepper in a bowl and stir to combine. Place on a parchment lined sheet tray and roast for 10 minutes, or until softened. Set aside. Place the onion confit, roasted cherries, and chèvre evenly along the puff pastry and then sprinkle the thyme leaves over the tart. Place in oven and bake, rotating once, for 20 - 25 minutes, or until golden brown and puffy around the edges. Serve immediately or at room temperature. ***I changed the onion confit recipe a little -- I chopped the cippollini onions (you can substitute Vidalia onions) and I substituted 1/2 cup golden raisins and 1/2 cup currants for the 1 cup raisins.